Frelick opened the panel by offering an overview of the discussion topic. States, he explained, are embracing “externalization,” a concept he defines as “extraterritorial state actions to prevent migrants, including asylum seekers, from entering the legal jurisdictions or territories of destination countries or regions, or making them legally inadmissible without individually considering the merits of their protection claims.” Put simply, externalization is any extraterritorial measure a state takes to prevent migrants from setting foot in their jurisdiction, where they avail themselves of rights. According to Frelick, externalization is often deceptively framed as a “lifesaving humanitarian endeavor” meant to “protect migrants from dangerous journeys” rather than a tool for migration containment. He then cited examples of externalization in practice. He focused on European and American immigration policies, especially after 2015, which is commonly cited as the starting year of the worldwide refugee crisis fueled by ongoing humanitarian crises across the globe. According to Frelick, externalization has been a “central plank of European migration policy” since the mass influx of migrants into Europe in 2015. The EU Emergency Trust Fund for Africa put 3.4 billion euros forward in scrambling to address the crisis. Much of that money came from the European Development Fund, which is typically used for general development purposes but was then repurposed to stem migration. He went on to say that today, 80% of humanitarian aid is “engaged with forced displacement.” Moreover, only 1% of this funding is used to provide “safe and legal channels for entry into the European Union,” while the bulk of the money is conditionality— that is, a bargaining chip to encourage states seeking development assistance to cooperate on migration controls. This money often goes to maintaining and entrenching oppressive regimes which create the conditions for mass emigration in the first place. Frelick specifically cited the issue of Libyan migration, stating that 42.4 million euros has been directed to Libyan border coast guards to enhance their capacity to manage the border, which, in turn, stems migration both into Libya and from Libya into the European Union. He also referred to the EU – Turkey deal from March 2016, which gave the Turkish government 6 million euros to host immigrants (particularly from Syria) and prevent onward migration. Apart from granting Turkey funding, the deal, greenlighted Turkey to create safe zones in Syria to prevent migrants from entering Turkey at all. Elaborating on her first point, Zamore noted that most refugees live in developing countries like Chad, Uganda, and Ethiopia, where the governments largely keep their borders open. She spoke specifically about Lebanon, where the government has closed its borders after having accepted 1 million Syrian refugees, meaning 1 in 4 people in Lebanon is a Syrian refugee— the equivalent of the US having accepted 82.5 million refugees. Consequently, the burden of the worldwide refugee crisis is not globally shared, as ten of the world’s developing countries host most of the globe’s refugee population. Addressing her second point, Zamore remarked that, although refugees often stay as such for extended periods of time, the humanitarian system (the international community’s default response to refugee crises) operates on short-term budgets. She noted that there are now three generations of Somali refugees living in the Kenyan refugee camp of Dadaab. This means that those who originally fled Somalia are now grandparents to the newest generation of Somali refugees in Dadaab. Zamore then discussed what she called the “new liberal consensus,” which acknowledges that refugees remain refugees for long periods of time and largely occupy developing countries; as such, countries with large refugee populations should be the recipients of development aid rather than exclusively short-term humanitarian aid. Thus, refugees can incorporate themselves into labor markets and out of camps, ensuring freedom of movement and the right to work. This approach is slowly emerging among the international community— for example, the World Bank has created a “refugee sub-window” of its International Development Association fund, meaning $2 billion is now directed toward governments and communities hosting the most refugees, making the transition out of temporary infrastructures a reality. According to Zamore, there is nothing new about this approach. In the 1960s and 70s, the so-called “golden age of asylum,” the progressive developmental state model created a welfare state into which refugees were incorporated. In the 1980s, the system transitioned to a largely unsuccessful new development model emphasizing deregulation, privatization, and minimal safety nets for the poorest of the poor. Zamore describes this model, imposed on host countries for the past few decades (though with time, becoming increasingly concerned with inequality and welfare), as “fundamentally incompatible with refugee rights” and names it “largely responsible for the impoverishment of refugees and host communities in these countries.” She cites Somalia, where the per-capita income is 40% lower than that in 1970, and Afghanistan, where the per-capita income just reached its 1970-level. Zamore emphasized the role the International Monetary Fund (IMF) plays in this failed development model, calling it the “biggest player affecting refugees today” despite being uninvolved with discussions surrounding refugees. In countless states, IMF programs require governments to pay “obscene” debts, which draws the focus away from development or refugee protection. Meanwhile, with the emergence of this new liberal consensus, the international system asks these countries to incorporate refugees into their school and healthcare systems, which pulls host governments in two opposite directions. 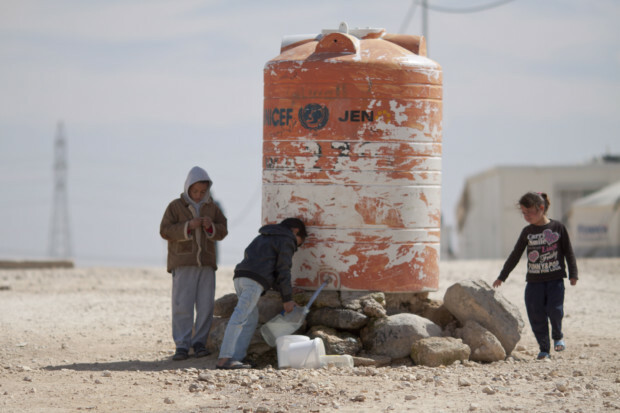 In Jordan, for example, which is host to 600,000 Syrian refugees, the IMF program states that Jordan’s first priority for 2020 is lowering its debt by 17% percent. Jordan has thus cut refugees out of its public subsidized healthcare programs in an attempt to rid itself of debt. In her closing, Zamore offered more positive news, noting that the debt conversation has picked up since her entrance to the discussion, and that more “critical voices” are being incorporated into these discussions. Mustafa maintains that the current system seeks to force refugees to maintain as such. Policies working toward giving refugees long-term legal status are not being considered, which, it appears, only perpetuates the crisis. Mustafa criticized the idea that giving refugees legal status prevents them from returning home, stating that the lack of legal status for Syrian refugees in Lebanon, Jordan, and Turkey is the reason why Syrians fled to Europe in the first place. She further emphasized the lack of dialogue between development initiatives and policymaking, citing fear of politicization as the reason why development agencies and policymakers fail to collaborate. This, Mustafa says, is the root cause of the perpetuation of the crisis: why give refugees job training through development programs if no policy exists to give them the right to work? Moreover, the longevity of the international community’s failure to effectively address refugee crises has given rise to problems that did not previously exist, like lack of resources and donor fatigue. According to Mustafa, the inclusion of the refugee perspective into these discussions is a necessary step toward finding a solution. After founding Network for Refugee Voices, Mustafa has engaged in diplomatic fights with governments to get herself a seat at the table. She was granted an observer seat at the Global Compact on Refugees and managed to make the Compact’s final document draft acknowledge refugee participation.